Art Every Day Month is coming soon! Believe it or not, it's almost November and Art Every Day Month is right around the corner! For those not familiar with the challenge, about 10 years ago, I was inspired by Nanowrimo (National novel writing month) to create a month long challenge of my own with art. The first year, I did the challenge on my own, posting piece of art (or a larger work in progress) every day on my blog during the month of November. The next year, a few people joined in with me and since then, the challenge has grown to include hundreds of creative people, committing to a month of creativity. It's amazing! Every year, I find myself inspired and uplifted through the process of creating and sharing every day and through seeing the work of others. When I say art, I mean it in the broadest sense possible. There have been people who have written a poem every day, taken photographs, painted, made jewelry, done mandalas or doodles, sewn, knit, cooked, some mix of creative acts, and so on. Sky is the limit. I like to challenge people to jump into the challenge, but I also want it to work for you, so make it your own. Post your creations once a week (or not at all if you don't have a place to share them online), if you fall off the wagon, jump back on when you can. The main thing I want from AEDM (Art Every Day Month) is to bring more creativity into the world. Why not join me? You can learn more about the challenge here and sign up for Art Every Day Month 2012 here. 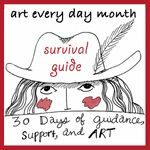 And if you need a little extra help, you can sign up for the Art Every Day Month Survival Guide, a private blog, where I'll share a post each day for the 30 days of November filled with prompts, quotes, inspiration, a weekly audio exercise to help you stay on track. I’m in. 2011 was my first year. This is a great challenge. Looks like a lot of fun. Love the way you embrace all forms of creativity! This is my 7th! I have my plan in place. Let´s roll!